After all the bad news about the continuing problem of Ebola, including its persistence in the fluids of some people who thought they had been cured of the disease, there is good news on a different health front. The beleaguered World Health Organization reports that the number of polio-endemic countries is now down to two, as there have been no cases of polio in Nigeria over the last 12 months. Several things are interesting about the Lancet article. One is that ridding the world of polio has proven to be expensive. So far, $11.3 billion (of which $1.1 billion came from polio-affected countries) has been spent toward the GPEI since 1988. In comparison, the Lancet reports, ridding the world of smallpox (“the first and only human disease to have been eradicated”) cost only $280 million. Moreover, it took 14 years to eradicate smallpox, while the target date for eradicating polio looks likely to be shifted from 2018 to 2019 at a minimum. Experts are cautious about declaring victory in any case, since in 2012, after cases of polio had dropped, the next two years saw large increases in several countries. It is a “rocky road to zero,” according to the independent monitoring board that tracks progress against the disease. Second, the two remaining countries with polio are Pakistan and Afghanistan. 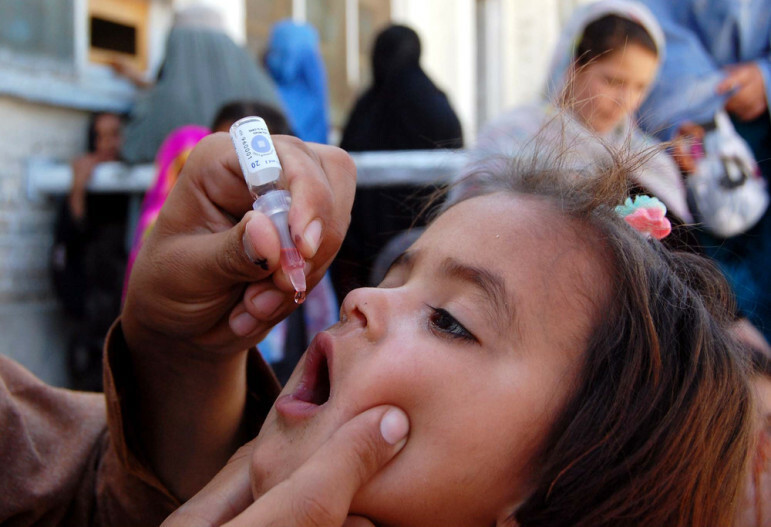 Of the “wild poliovirus cases” reported in the world last year, 85 percent were in Pakistan, which the Lancet says is actually exporting polio cases to Afghanistan. The instability caused by warfare is a problem for eradicating polio, especially in areas such as Iraq, Syria, Somalia, and Yemen, as well as Pakistan and Afghanistan, where there has been recent substantial displacement of refugees and consequent population movement. It goes to show that technical or vaccine solutions to a disease like polio can be undone by factors that aren’t treatable by vaccines. The 700,000 children who have not yet been vaccinated in Afghanistan and Pakistan reflect the difficulty of reaching populations in conflict zones.